Earlier this month at WWDC, Apple shared its new 10.5 inch iPad Pro model with larger display and ProMotion technology. 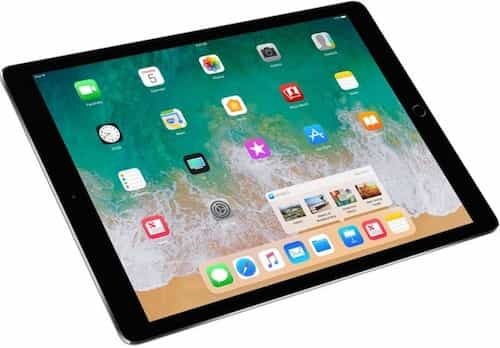 Apple has improved upon one of its best-selling and well made products, the iPad Pro this year with the addition of 2 new models, the 12.9 and 10.5 inch iPad Pro models that offer larger displays by using smaller bezels. The 10.5 inch iPad Pro replaces the prior 9.7 inch model. Apple said that it chose the new screen 10.5 screen size because it allows for a full on-screen keyboard as well as an add-on Smart Keyboard. Designers, videographers and anyone using the Apple Pencil will be thrilled by the ease of use available now through the ProMotion display technology that provides faster, fluid scrolling at a refresh rate of 120Hz, smooth motion and swifter responses. The Apple Pencil’s lowered 20ms latency also creates a more natural experience for drawing. Depending upon motion activity and usage, ProMotion adjusts the refresh rate of the iPad Pro display and thus makes the battery last longer. With a a 2732 x 2048 resolution for the 12.9 inch model, this iPad Pro has 5.6 million pixels, greater than any iOS device. The 10.5 inch iPad comes in at 2224 x 1668. Both animation and movement appear far more seamlessly on both models using the new ProMotion display technology, thus enabling these 2 iPad Pro models to display HDR video for the first time for iOS 11. Other improvements include a brighter 600-night display with True Tone that adjusts for outdoor lighting. There is also a larger color range support, resulting in more vivid colors. 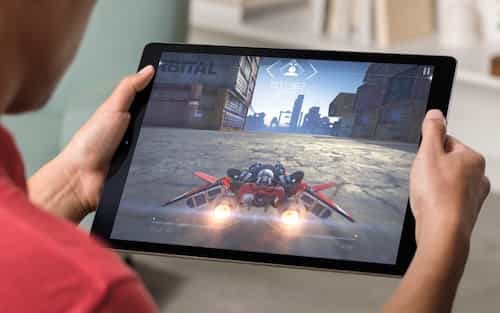 The iPad Pro models also come with upgraded A10X Fusion chips for both a 6-core CPU and a 12-core GPU that provide 30% and 40% faster CPU performance compared to prior iPad Pro models. The new iPad Pro models also benefit from the improved camera system introduced first in the iPhone 7. The FaceTime HD camera is 7 megapixels, while the rear camera is 12 megapixels and also offers optical image stabilization. Both models also have four-speaker audio systems. Support fast charging through USB-C charge adapters with a Lightning cable. The new models also provide up to 10 hours of battery life. Designed for iOS 11 Shipping with iOS 10, both new iPad Pro models were designed with iOS 11 in mind, introducing the new Dock for multi-tasking, App switcher, Files app, Drag and Drop and more features.